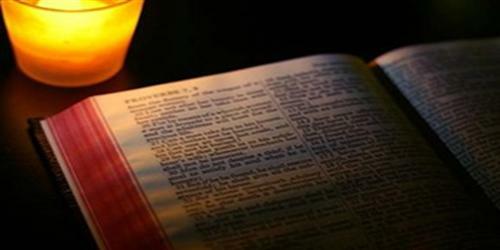 • Reading in dim light is harmful for your eyes. Using your eyes in dim light does not cause damage. It is true however, that good lighting makes for easier reading and can prevent your eyes from tiring out. If you don’t blink enough, it may also cause some dryness. But that’s about it. How else did our great great grandparents read or sew by candlelight before the invention of the tube light? • A cataract must be ripe before it is removed. With modern cataract surgery, it is not true. When a cataract keeps you from doing the things you like or need to do, you should consider a removal. • Children will outgrow Crossed eyes. Infants’ eyes are known to occasionally wander until they are 6 months old. 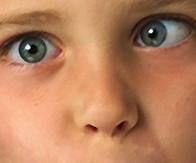 However, if you notice your child’s eyes crossing even a little bit, you should get them checked by an Ophthalmologist. Untreated squints can go on to develop amblyopia or lazy eye which can cause permanent loss of vision. • Eyes can be transplanted. The entire eye cannot be transplanted. Once the optic nerve (the nerve connecting the eye and the brain) has been cut off, it cannot be reconnected. However, the cornea (the outer transparent part of the front of the eye) can be transplanted. Also, during Cataract surgery, artificial lenses can be implanted. Sitting closer than required may cause headaches, but not eye damage. 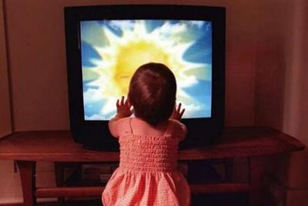 Children have a shorter focal distance than us adults, so they won’t strain their eyes. Oh, but if you own a television set from the 60’s, you might be at risk from radiation emitted by the TV screen! • People with weak eyes should not read fine print. Focusing on intricate details or reading fine print does not damage the already weak eye. Your eyes are just like a camera and using them to photograph fine details won’t wear them out. • Wearing the wrong kind of eyeglasses cause damage to your eyes. Although wearing correct glasses help improve your vision, wearing wrong ones will not physically damage your eyes. 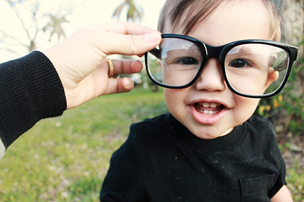 However, kids below the age of 8 years should wear their own prescriptions to prevent amblyopia. There is no strong evidence to support the claim that eye problems are the culprit of learning disabilities. They are more of a psychological issue. • Using Computers cause damage to your eyes. Working on computers for long doesn’t harm your eyes. However, using the computers for long can lead to the Computer Vision Syndrome. Because you tend to blink less often, you may experience dryness of your eyes. You should take regular breaks in keeping with the 20/20/20 rule: Take a break every 20 minutes for 20 seconds to look at something 20 feet away. Glasses do not cause deterioration of your eyesight, they are just a tool to help you see better. Off course, once you see the difference that glasses make in your vision, you would want to wear them more often. This isn’t dependency, you can always go back to not wearing them… but why would you? Now that you know the facts from the myths, use this knowledge to take good care of your eyes. “If we all worked on the assumption that what is accepted as true was really true, there would be little hope of advance”.